WHO WE ARE? I Carbonari della Commedia (ICdC) is a non-profit theatre company formed in 1981 with the aim of offering theatre performances and cultural entertainment. 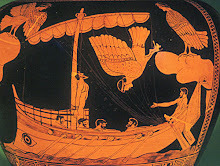 We are committed in promoting Italian culture and language to the larger possible audience. For this reason ICdC productions are realized either in Italian or in English or both. I know is messy, I know it could e better, I know i co uld have done it before but... What do you want...here my first real post! . Finally I did it! my first post. I hope someone will immediately make a comment! well first I should give you some infos... This is our second Commedia dell'Arte production. Do you think the picture is not so clear? well there will be many more to come now that I know how to play with this toy! the piazza of the Italian Forum in Leichhardt. Great fun for both audience and actors. 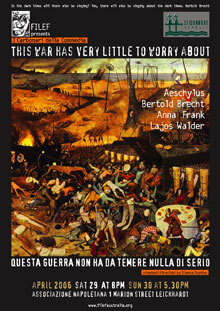 ICdC’s most recent productions in 2006/2007 included: This War Has Very Little to Worry About celebrating the 50th anniversary of the death of B. Brecht (a very well known and much appreciated playwright in Italy). Performed in both Italian and English. In December 2006: we performed our first Commedia dell’Arte production the 'canovaccio' Gratta, gratta Pulci~nella!. 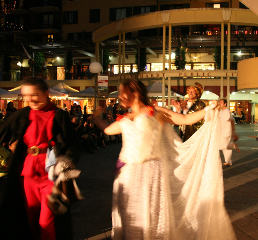 A street theatre show performed in the heart of Sydney's Little Italy: the Piazza of the Italian Forum in Norton street. 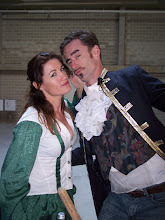 this is when we fell in love with COMMEDIA! As we ended 2007 with the new Commedia dell'Arte production Masks & Buffoons we are planning, for this year 2008, to capriole from dell'Arte Commedia to Divina Commedia, and we will do it with style! Always expect the unexpected from I Carbonari della Commedia!